Have you ever had a bad experience with permanent makeup or a tattoo that you regret having put on and can't wait to remove it? Well wait no longer. Our PhiRemoval (tattoo removal) service will change the appearance of the unwanted PMU (permanent makeup) or Tattoo's forever. 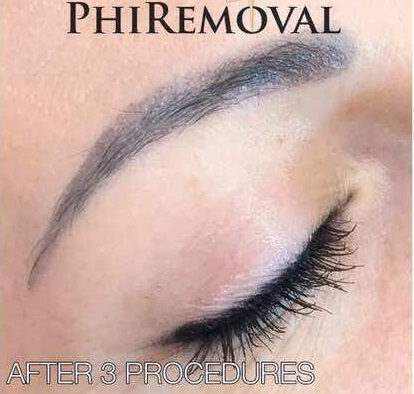 PhiRemoval is the best and most highly efficient, safe and effective way to remove PMU or Tattoo's that your not happy with. PhiRemoval is based on glycolic acid and features an ingredient with high penetration qualities that when applied to the skin deeply penetrates surrounding tissues and pulls old pigmentation from past procedures. There is no need for laser or other mechanical procedures. A staccato like motion is applied that opens up the skin at the same time avoiding damage to it. Once the PhiRemoval solution penetrates the depositing skin layer it liquefies it and "pulls" the old pigmentation to the surface. PhiRemoval is non-color selective meaning it can be used on all tattoo colors and is significantly less expensive then other removal methods. The number of treatments depends on the removal area and size of the tattoo or PMU to be removed. In some cases only 2 treatments may be required. For deeper tattoo's with an over abundance of pigment or a body tattoo, several treatments may be required. The time required for treatment is also dependent on the removal area and size of the tattoo. The treated area may experience some initial erythema (redness) which gradually diminishes,leaving the skin perfectly normal. PhiRemoval is effective for both body tattoo's and permanent makeup and microblading. Depending on the tattoo being removed, a tattoo machine or a hand held instrument is used to break the skin providing access to the old pigmentation. The tattoo extraction formula is then applied with a cotton swab and begins working almost immediately. The original tattoo ink is then drawn out and wiped off. The ink continues to be drawn out through the natural scabbing and healing process following the next few days. The exact process is repeated over a number of treatments once the skin is fully healed. If budgeting for this procedure is a challenge, HQ Beauty Care offers an easy payment plan. Click the button below to learn more.